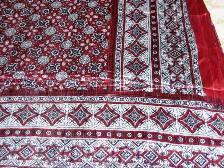 Ajrak of Sindh - A hallmark of the Indus Valley civilization, the province of Sindh....this ancient artwork is made from vegetable dyes with block prints in navy blue on maroon background traditionally. The vibrant patterns when added with some hand embroidered thread work, turn into pieces of art. These can be used as throws, bed sheets and table covers. 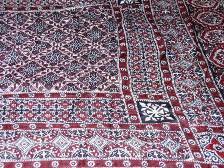 It is traditional in Pakistan to present it to their respected guests, a symbol of honour and prestige. This can be worn as the traditional head wear or as a shawl. The region has known this particular work of art since ancient times, also called Ajruk. The preparation of Ajruk in several stages, starting from the basic cotton cloth that is then bleached in a very rustic and ancient manner - using camel dung. The piece of cloth is then dyed in the traditional colors of navy blue and maroon using stamps made from wood to put patterns on the cloth. The cloth is washed extensively till all residue of the processing materials is thoroughly washed out. Embroidered motifs are added to add value and beautify this vibrant length of material. The pieces are further adorned with sequined work and beads to give it a more festive look. Golden thread-work is added for adding to trousseaux. Other than home textile, it can also be stitched as Shalwar Kameez, the traditional wear of women of Pakistan - with a beautiful Ajruk dupatta (scarf) to match.